Today I was talking to a friend about buying homeschool curriculum and budgeting, and we both agreed on one thing- Homeschooling is expensive. It would be TONS of fun to have an unlimited homeschool budget, but few of us have that luxury. Luckily, there are many programs out there that will give you a full year’s curriculum for free. Score, right? Here are my top picks to complete language arts for free, which hopefully can free up some of your curriculum budget this year! Want other subjects for free too?? 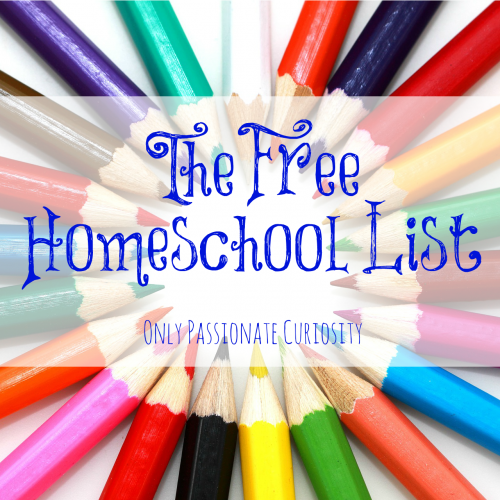 Check out the FREE List for more homeschooling freebies- Links to hundreds of quality resources, all sorted by subject and grade level. I’m constantly adding to the list, so follow me and never miss a post! Taking writing homeschool curriculum requires self motivation and the course itself should be able to hold your interest. You should be able to learn with your own initiative. Thank you so much for this wonderful share! You are amazing! Thank you for all the things you share! This is awesome! Thanks for putting this together. I had a similar idea for my own blog catering to homeschoolers from my own country, I just don’t have the time to do this massive work! I hope it will be all right to link to this post from my own website. It has been a huge help! I’m sure others in my country will find it helpful, too. There is a Treasures student textbook that goes along with the workbooks. Isbn-13 978-0021988150. Does anyone know what’s in it? Maybe the books/stories for each unit? Or is it a compilation of the workbooks? Can’t seem to get any info about it. Thanks! Thanks so much for sharing, Ruth! Where do you get the books that go along with the Treasures workbooks? Not all of them are at my library. Thanks. Amazon.com has a fantastic used book collection. That’s where I get them. Oh my goodness, this is the post I have been searching for. Thank you so much!!!! Thanks for pointing it out! I found a cached version, so I re-linked that one, but who knows how long that will hold out. In the meantime, I’ll look to see if they moved them. It’s a shame- it was a wonderful resource! Hi, Thanks so much for posting. This has been a huge help. I was just in the middle of printing from your Scott Foresman Reading link and the link stopped working while I was in Unit 2. I haven’t had any luck with Google and I’m not sure which workbook it came from to see if it is available to purchase. Do you have any idea? I tried one more time and it worked! Thanks again! I cannot express how happy this makes me!!! Squeeeeeee! Thank you so much for sharing this! This is awesome… thank you I’ve been struggling with finding FREE… or inexpensive… and I ‘ve wanted to do the best for my daughter without having to spend a ton of $$… so thank you sooooo much… I’ll be sing up for your news letter now… blessings! HI, I just came across your site and it is great! I am curious as to what you use for phonics and teaching your child to read. Thanks for all the great info! These days, my favorite Phonics program is Logic of English Foundations- it’s very hands on, fun, and good for active kids. More importantly, it works. With my first, I used a lot of free stuff from Starfall and Progressive Phonics, but these days, my kids who are learning to read need “more” which is where Logic of English comes into play. Thank you so much! I’ve been agonizing over what to do and the first thing on your list is exactly what I was looking for!! Wonderful! Due to moving to Uruguay and the inadequacies of the private schools available to me, I have had to undertake my son’s schooling. Homeschooling is mind boggling for me, with all of the options, not knowing which direction to go, and knowing my son has suffered an obvious set back in his education due to various circumstances. So when I find people such as yourself, willing to share educational know how and FREE product links, I can’t express how grateful I am. In my opinion, education should be free. Humanity has so much to gain by offering quality education to it’s children. My compliments! I just love your blog! Keep up the great work and best wishes to you and your family! Do you know if there are answer keys for any of this. Don’t forget vintage books, which are incredibly solid, free resources. The McGuffey readers are free on kindle, Primary Language Lessons is free as well. Webster’s Speller is available free. Charlotte Mason’s ideas on copywork and dictation are free- just make them yourself after reading about her methods from one of the many, great CM websites. Great post! Sharing on What’s Hot in Homeschooling tomorrow. Thanks so much. We are using part of the Modern Grammar stage lit from CHOLL, and we love it! Thanks for the list. I’ll be sharing it with my followers. Fantastic list of resources! Thanks for sharing – we’ve been homeschooling for 9 years and I’d never heard of a couple of them.